Monday August 27th 1883 I was all the forenoon doing the washing Mother went to town in the afternoon and I cut out a couple of shirts and got them nearly done. Wrote a card to Charlie and Vene this afternoon. 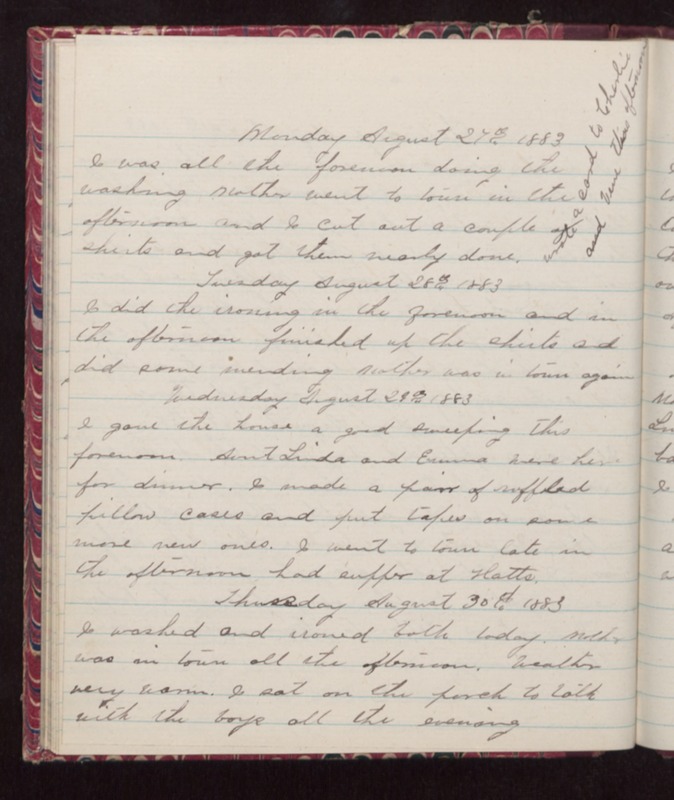 Tuesday August 28th 1883 I did the ironing in the forenoon and in the afternoon finished up the shirts and did some mending Mother was in town again. Wednesday August 29th 1883 I gave the house a good sweeping this forenoon. Aunt Linda and Emma were here for dinner. I made a pair of ruffled pillow cases and put tapes on some more new ones. I went to town late in the afternoon had supper at Hatts. Thursday August 30th 1883 I washed and ironed both today. Mother was in town all the afternoon. Weather very warm. I sat on the porch to talk with the boys all the evening.